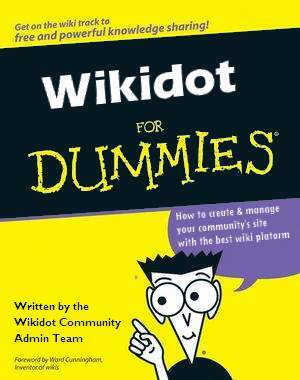 Perhaps we could create some more "Videos for Wikidot Dummies" and upload them to YouTube, too! Also, I changed the theme to the widened version for a better fit of the hammer template. Welcome to our book project! Above you will see the link to the original post with the first question for such a book. The picture aside was created by Rob (user RobElliott) as a very good gag (thank you for this!) and had a quick reaction: Kenneth (user tsangk) has build this wiki as a working set for an araising book. I have only inserted 3 divisions/categories using the csi:hammer-navigator and a (minimum) forum. >>> Discussion - ..threads are here "pages" (with comments). >>> Proposals - all is allowed. Everyone is invited to join this site and help!